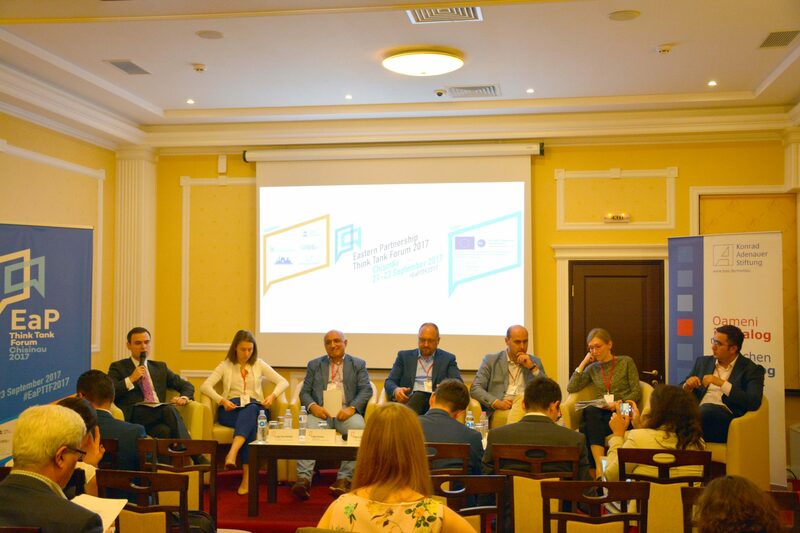 Two months ahead of the Eastern Partnership Summit, over 60 international and local experts gathered in Chisinau on 22 September for the first edition of the Eastern Partnership Think Tank Forum (EaP TTF). The event was organized in the framework of the EaP TTF project funded through the EaP CSF Re-granting Scheme 2017, as an initiative of the Institute for European Policies and Reforms (IPRE), the Georgian Institute for Strategic Studies (GISS) and New Europe Center (former Institute of World Policy). The day of discussions led to the development of a set of policy recommendations for the EaP Summit, also taking into consideration the Civil Society Declaration that will be adopted in Tallinn at the 9th EaP CSF Annual Assembly and EaP Civil Society Conference 2017, as well as the 20 Deliverables for 2020 document, reviewed in June. On a broader perspective, the EaP Think Tank Forum event was created for enhancing connections among the think tank community from the EU and EaP countries, with the aim of generating a maximum impact on their research, policy making and advocacy activities in promoting European values across the EaP region. Daniela Morari, Deputy Minister of Foreign Affairs and European Integration of the Republic of Moldova, opened the debate stressing that: “We should commit to more ambitious deadlines and more concrete results to deliver to citizens. Our priorities are roaming tariffs, youth and mobility for media and civil society, SMEs development, and enhanced communications & visibility for the EaP region. Also, the Civil Society Declaration should send a clearer political message, with EU and Partner countries recommitting to EaP, while acknowledging achievements, and recognizing European aspirations”, to which Ambassador Peter Michalko, Head of Eu Delegation in Moldova added that: “The Eastern Partnership Summit will build on Riga Summit’s strong engagement and commitment”. In a similar vein, EaP CSF Steering Committee members further stressed the need to reiterate the political ambitions and messages of EaP initiative, often overlooked as a consequence of bureaucraticization, as well as the importance of strategic communication and visibility for the EaP region. Against this background, civil society should also take on a more political role, while monitoring the institutionalization process and promoting horizontal cooperation between countries, taking avantage of the multilateral nature of the EaP. According to EaP CSF Steering Committee member Ulad Vialichka, “Depoliticization and constant compromising are the current challenges of the Eastern Partnership. Its extra value is the multilateral dimension”. Natalia Yerashevich, Director of the EaP CSF Steering Committee Secretariat, also provided an outlook of the most important outcomes of this year’s Civil Society Conference and 9th EaP CSF Annual Assembly, in view of the Eastern Partnership Summit.